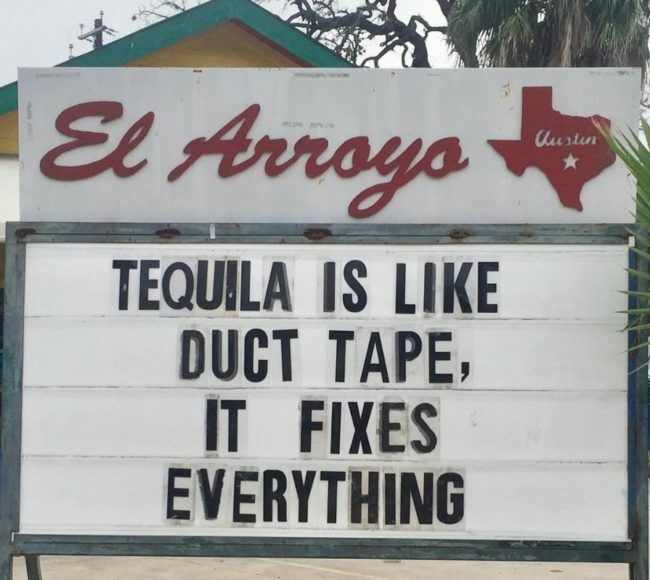 There’s nothing like a good funny sign to brighten up your day and this Texas restaurant has the very best in the game. 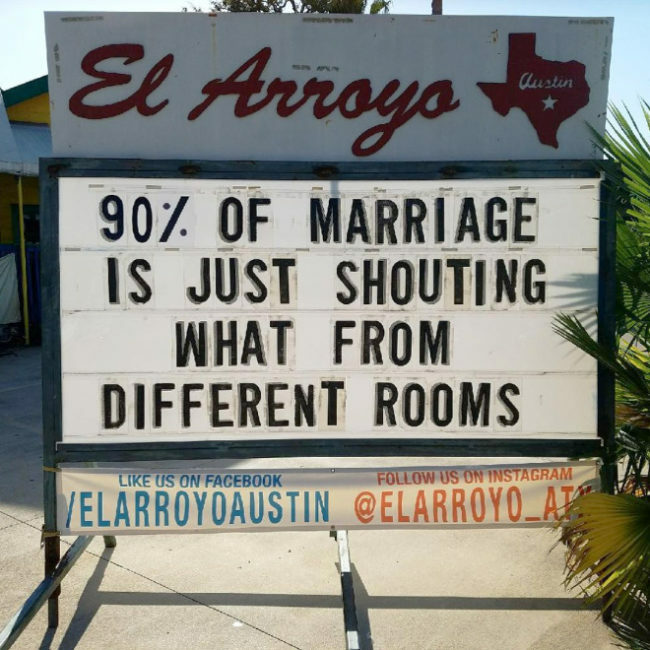 I’ve NEVER thought about it this way. But WHICH ONE is unplanned? 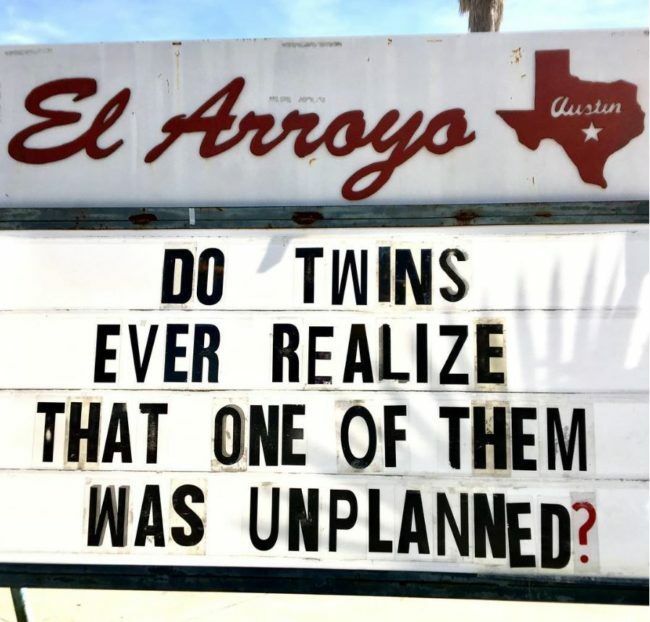 Surely both of them are unplanned by default because they are both twins? Now I’ questioning everything. My life will never be the same. How can a sign hold so much power?! If no one sees how terrible you are at it, you’re fine, it never happened, you got away with it. 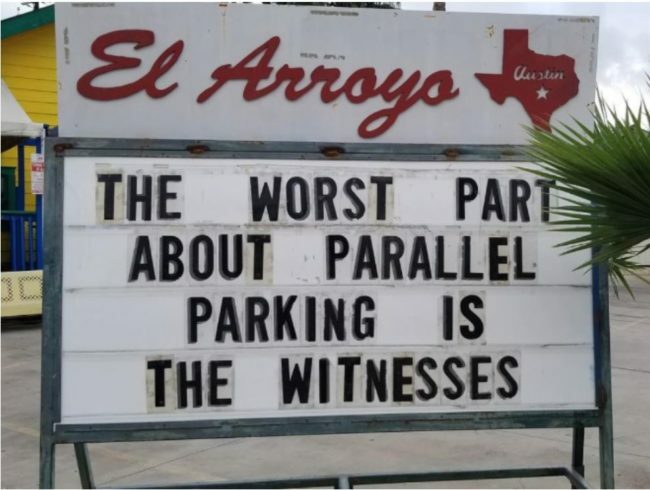 HOWEVER, when you take ten attempts to parallel park, a small crowd gathers, the local news station starts reporting on it, you NEVER live the shame down. 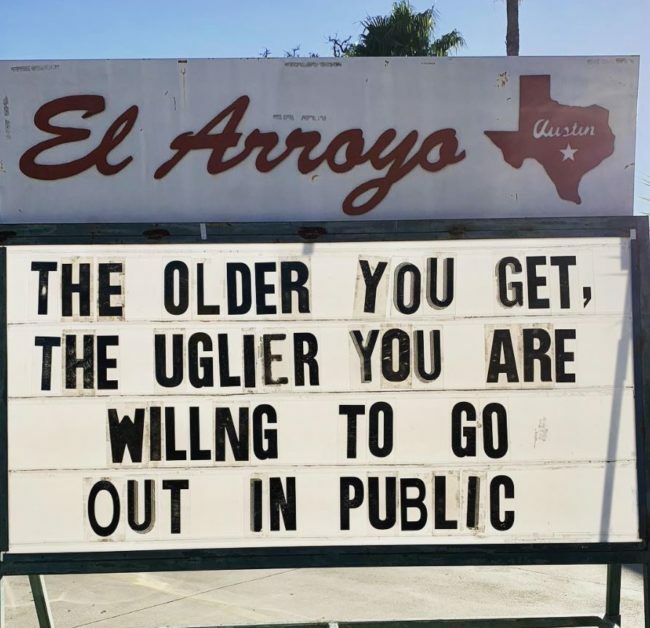 Might not be the best sign to have outside a restaurant but it’s true! My metabolism has abandoned me, leaving me to deal with the consequences of my eating ALONE. It’s a tough life. This is literally my childhood. My parents would should what from one room to the another while I sat there, going INSANE. I think I might get this tattooed on my body as a constant reminder. The WORST things happen when you combine drinking with Amazon Prime. Once I woke up to a Nicolas Cage pillowcase and a dinosaur taco holder being delivered to my door, don’t ask why. 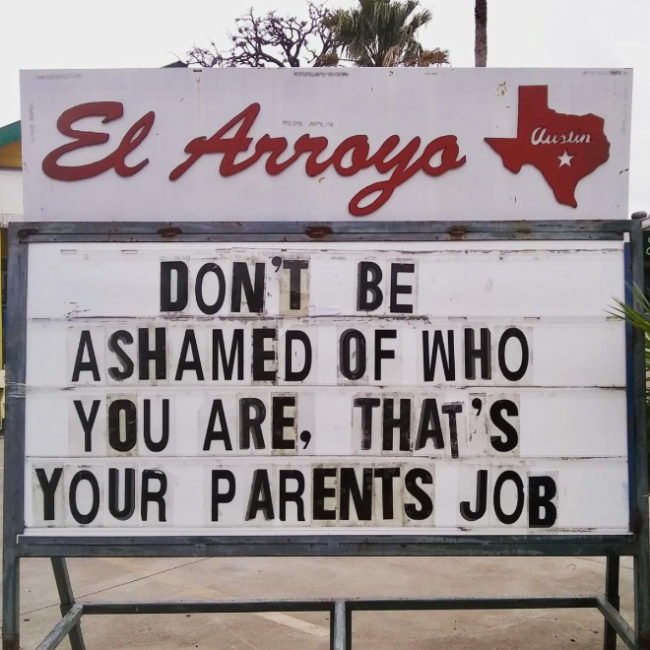 Remember, the only people that will ever be ashamed of you are your parents and who cares what they think anyway?! This sign is telling you to live your life YOUR way and bring shame to your family! 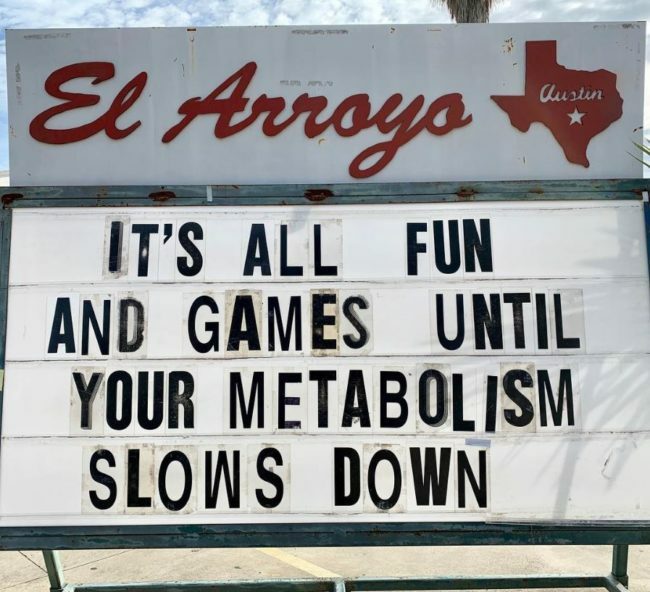 I couldn’t relate to a sign more! 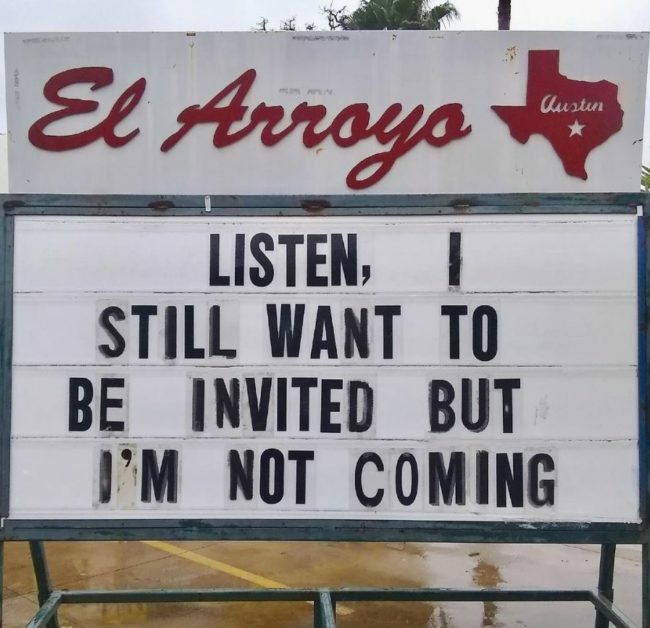 I always expect to be invited, even when I never go to something, if I’m suddenly not invited it’s like the most offensive thing EVER. That’s not unreasonable though, is it? The amount of times we have all had to endure ‘quick 5 minute meetings’ that literally could have been translated into a paragraph email is UNREAL. 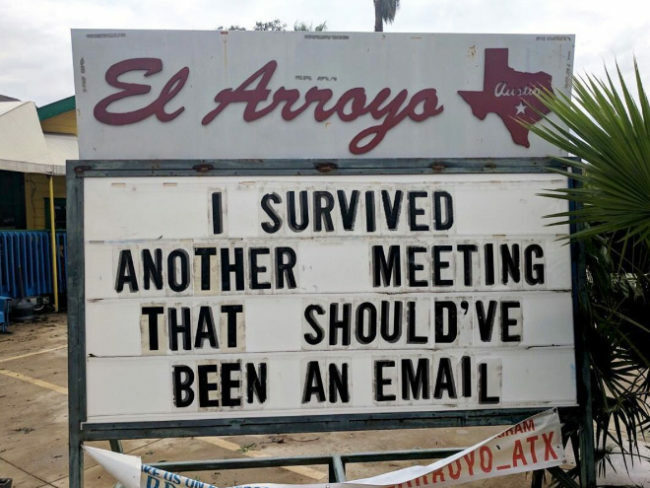 I think we all need to start a petition to ban these annoying meetings entirely. 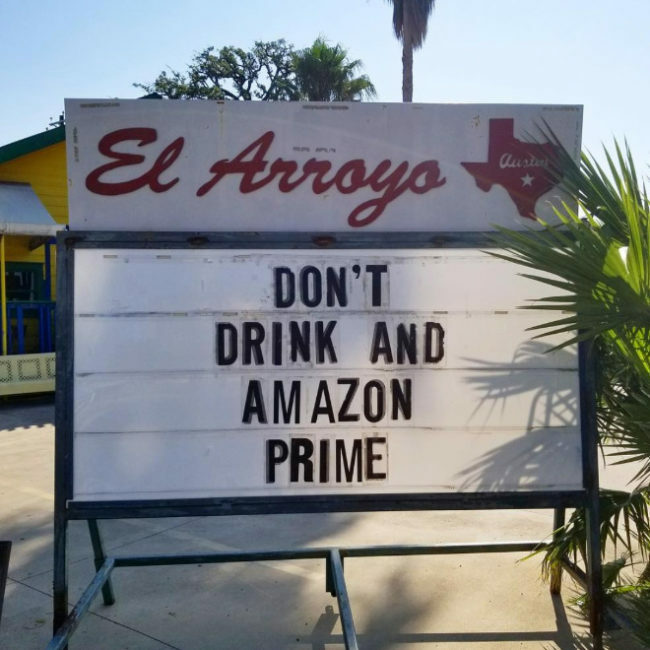 El Arroyo has our backs! 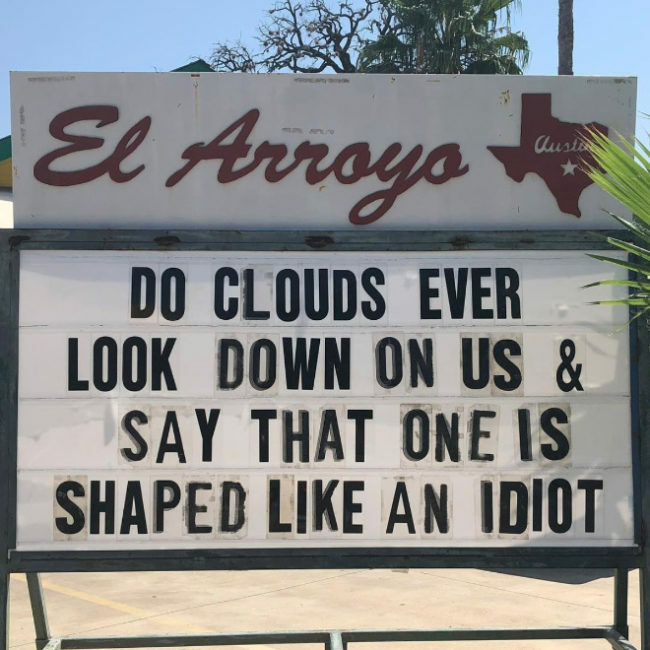 Why are we always judging cloud shapes? It’s about time the clouds starting judging us, seriously. There are so many people shaped like idiots, they would lose count! I’m not going to lie, this is exactly how I view life. 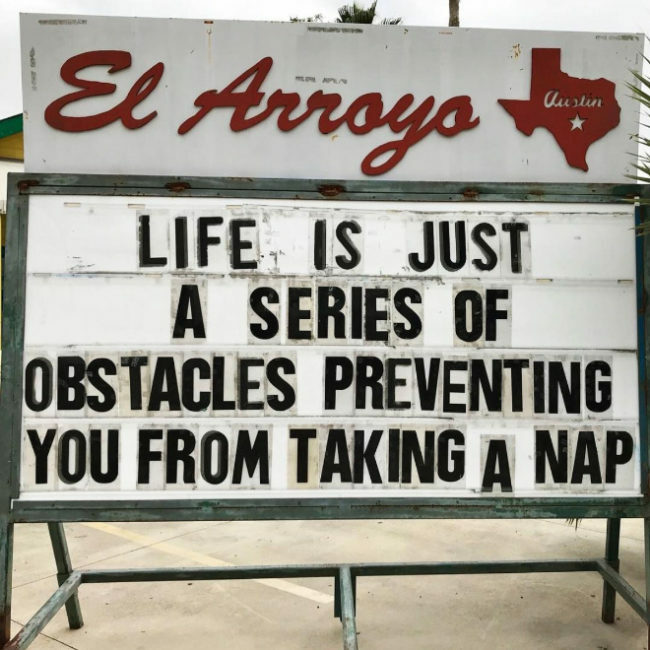 It’s just so many things stopping us from sleeping! When I think of sleep, I think of warmth, comfort and freedom of responsibilities. Why does life always come between us? 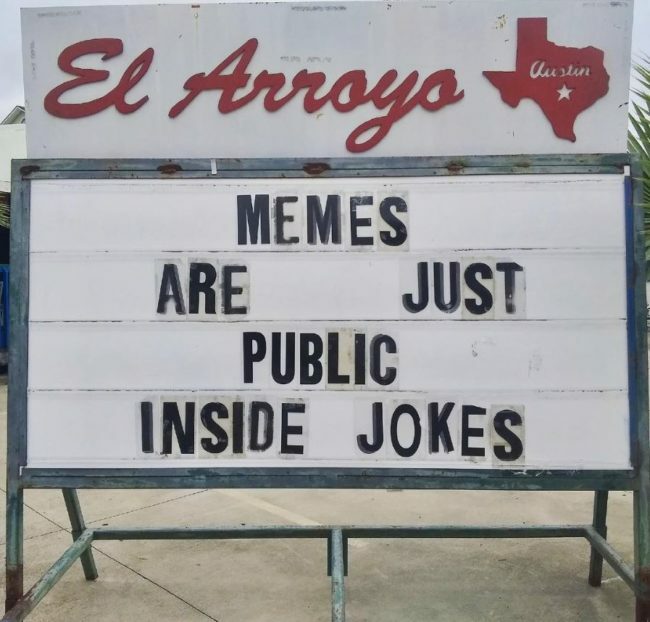 The thought of memes being public inside jokes makes me feel warm and fuzzy inside. It’s like we are all friends, laughing at the same thing that we pretend to not find funny as it’s an inside joke with EVERYONE. Makes me feel like humanity is wonderful again. This is somewhat believable. I mean, it will certainly make you forget your problems for a short while, not sure about SOLVING them though. But hey, each to their own. This certainly is a very dangerous tactic and is not something I would ever recommend. The number of times I’ve turned off my alarm, closed my eyes, woken up at 12 pm and realized I’m 3 hours late for work is slightly worrying. 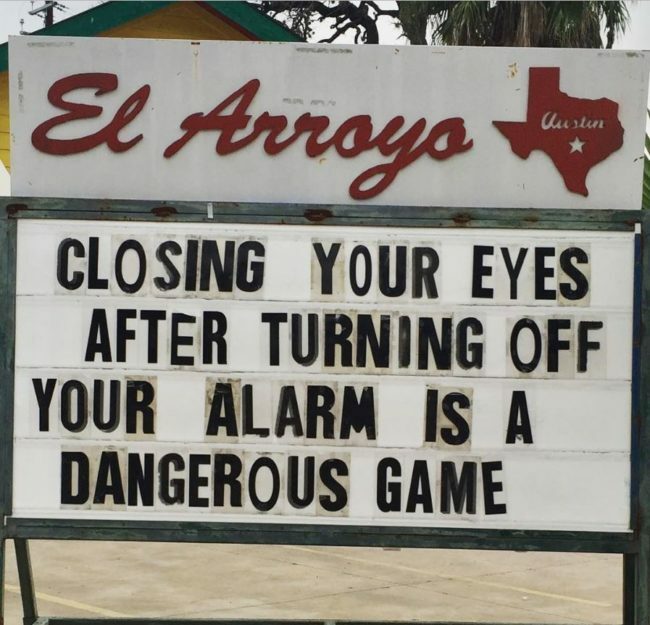 Next time, press snooze folks! 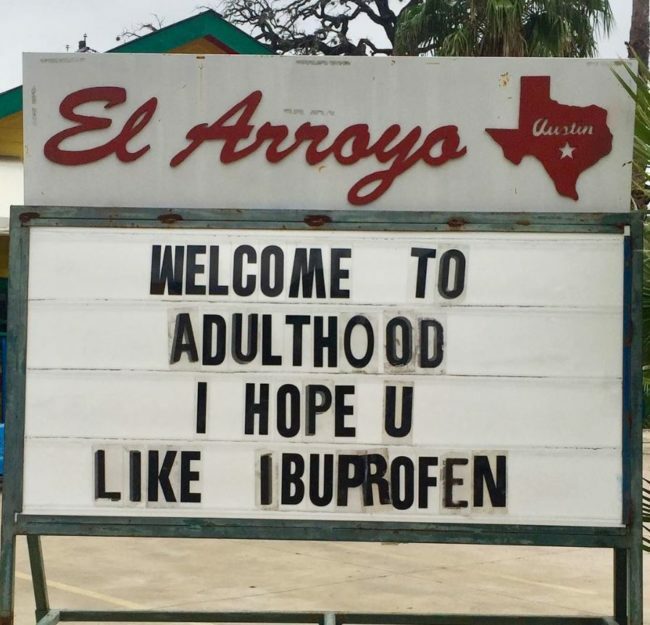 Honestly, if you EVER complain about a headache, cold, flu, uncurable disease as an adult someone will offer you an ibuprofen, no matter WHERE you are. You better get used to it, buddy. 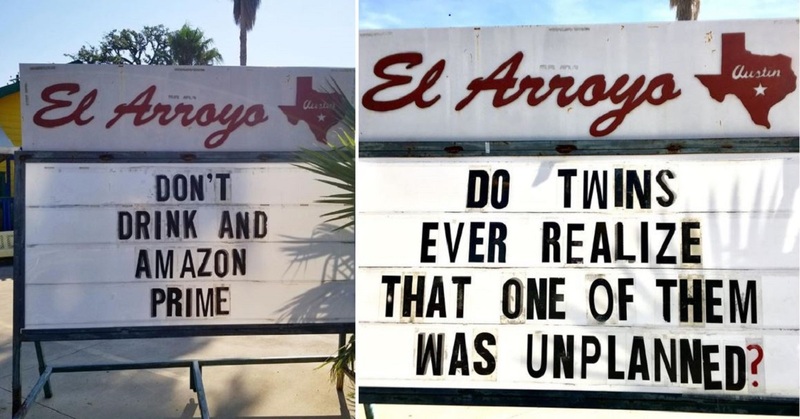 We hope El Arroyo brightened your day with their hilarious signs. I related to far too many of them and I’m not sure that’s a good thing…let us know your favourite in the comments!